Beach on Sixth is very handy Cotton Tree accommodation. Close to Alexandra Headland and even closer to Maroochydore Beach. Our superb holiday apartment resort offers you and your family the ideal place to stay on the Sunshine Coast. Our superb studio, two and three bedroom holiday apartments in Cotton Tree have crisp modern interiors that are exactly what you want for your holiday. A no fuss approach to accommodation with everything needed to make your stay as comfortable as can be. The apartment layouts have living, dining and kitchen occupying an open plan configuration, with balconies extending the living space outdoors. Perfect for taking your meals al fresco, and great if you want to relax with a good book in a sun lounger. The kitchens and laundries are all fully equipped. The most essential rooms for longer stays. Chefs will delight in the well laid-out kitchens with easy to clean stone and glass surfaces, not to mention the Miele cooking appliances. Even though the Sunshine Coast has a reputation for huge range of attractions and things to do, Cotton Tree has a ton of local attractions, but one of the most popular by far is the Cotton Tree Swimfit Centre. A huge complex with an Olympic length pool, families can enjoy the Water Park, the full-sized outdoor pool or splash around in the indoor pool. It’s heated warmer than the outdoor pool, but if that’s not warm enough there is also a smaller enclosed pool that is warmer still. The Swimfit Centre is a great place for fitness enthusiasts and families alike. Their learn to swim classes are also great for younger ones to become competent in the water in a friendly and safe aquatic environment. Not only is Cotton Tree a great place to swim, the parklands are also a boon for families, starting with Cotton Tree, right beside the Swimfit Centre and Nelson Park. For really long walks just follow the coast. Head south for Alexandra Heads Mooloolaba. Book your very handy Cotton Tree accommodation at the Beach on Sixth now. It’s all here. There are Cotton Tree resorts and then there are Cotton Tree resorts. Here is one holiday apartment resort that stands head and shoulders above the rest. Beach on Sixth is that place with gorgeously simple but elegant light-filled and spacious apartments close to Maroochydore Beach. We’re close to all the amenities that make Cotton Tree such a great place to holiday, and central to Sunshine Coast’s favourite attractions. Beach on Sixth offers a great range of Maroochydore Beach accommodation. Choose from the studio, 2 and 3 bedroom apartments. The apartments have a crisp and modern interiors — with the living, dining and kitchen areas sharing an open plan layout. The balconies extend the living space outdoors, where you can enjoy your meals al fresco, or chill with a good book. The kitchens and laundries are all fully equipped. The thoughtfully designed kitchens are kitted with easy to clean stone and glass surfaces and Miele cooking appliances. Cotton Tree’s local attractions include the Cotton Tree Swimfit Centre. A huge swimming complex with an Olympic length pool, Water Park, and an indoor area with a range of heated pools for the family. The Swimfit Centre is a great place for fitness enthusiasts and their learn to swim classes are great for younger ones to learn essential swimming skills in a safe and fun environment. You’ll find Maroochydore beach life here. If you are swimming it’s usually a good idea to visit a patrolled beach. All the local beaches from Maroochydore, Alexandra Headlands to Mooloolaba will have a stretch of beach (hint: between the flags) that is patrolled by surf life saving guards. For those seeking something different, Mudjimba Beach with it’s magical views of Mudjimba Island and long sandy beach is great for walking or kite flying on a windy day. Just across the Maroochydore River, Mudjimba is still close by. The northernmost beach you will see from your apartment, Yaroomba another sandy destination worth a visit. Fringed with pandanus the vast bleached sands and tumbling waves is a little oasis of natural beauty. Great for surfers, especially towards the headland of Point Arkwright, landlubbers can enjoy the views while walking over the headland on tracks and boardwalks leading to Coolum. If it’s beaches you’ve come for, this corner of the Sunshine Coast won’t disappoint. You’ll know you’ve found your perfect Cotton Tree resorts when you check-in at the Beach on Sixth. Book now. 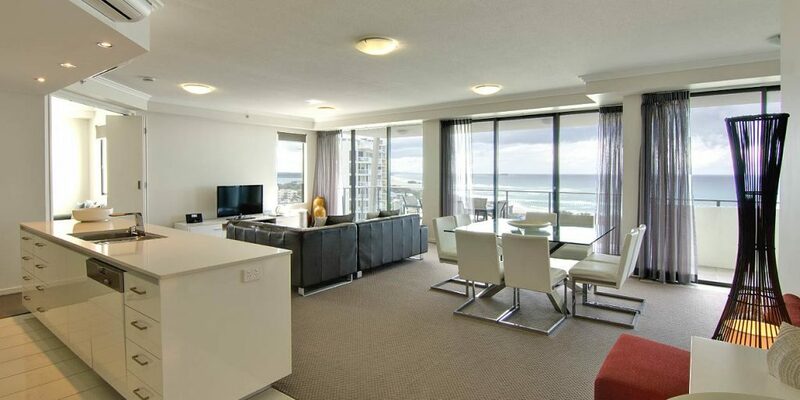 For holiday rentals Maroochydore, why not look at Beach on Sixth. Our luxury apartment resort is the perfect place to stay for your beach holiday on the Sunshine Coast. We have accommodation to fit any sized group from romantic couples to larger families and groups. Our studio suites, two and three bedroom apartments offer crisp, fresh and modern accommodation in the heart of Cotton Tree. Our central Maroochydore locale means you can park the car and walk, or use the excellent bus service. The surrounding beaches are superb. There’s a beach nearby to suit every condition required. 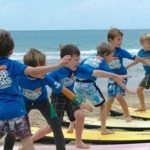 Whether it’s a mild mannered family beach that is fully patrolled like the Maroochydore or Mooloolaba Beaches, or something fuller flavoured for the surfers like the breaks at the Alex Headland, or Pin Cushion on the mouth of the Maroochy river mouth. Across the Maroochy River is the Mudjimba Beach, with it’s gorgeous views of Mudjimba Island, has a long sandy beach that is great for walking, or kite flying on a windy day. From your apartment, the northernmost beach you will see is Yaroomba. Another sandy destination worth a visit that is fringed with pandanus. The seemingly endless bleached sands and tumbling waves is an oasis of coastal beauty. A surfers haven, especially towards the headland of Point Arkwright. Non swimmers can enjoy the views while walking over the headland on tracks and boardwalks leading to Coolum. While you’re not enjoying the beaches, cafes or surf club bistros, the pool area back at the Beach on Sixth, with it’s lovely BBQ pavilion, outdoor dining furniture and outdoor jacuzzi makes it an ideal venue for relaxation and entertaining friends and family. There’s plenty of room around the table for the grownups and kids can have a splash in the pool or soak in the jacuzzi if you’re not. Prep is easy too in the chefs kitchens. Lots of bench space and easy clean stone surfaces, not to mention the Miele cooking appliances means meal times are a breeze for the kitchen whizzes. Enjoy the good times at our holiday rentals Maroochydore. Beach on Sixth. The pleasure will be all yours. Book now. This is possibly the best Maroochydore luxury accommodation you’ll find. For delightful Sunshine Coast holiday accommodation you really should take a look at these Maroochydore apartments. Crisp and modern, these fully self contained studio, two and three bedroom apartments at the Beach on Sixth can be found in one of the more relaxed parts of the Sunshine Coast, yet close to as much action as you can handle. The apartments are fully appointed with air conditioning, ceiling fans, Foxtel and wi-fi. With luxury furnishings and stunning views over the ocean and surrounding areas, this is the perfect choice for the discerning holiday maker wanting luxury accommodation on their Sunshine Coast holiday. Nearby, Alexandra Headland provide some of the Sunshine Coasts finest surf beaches and located beside the Alexandra Headland Surf Club is an outdoor skate park. It’s a popular skating venue, pack a picnic and enjoy the beach side location while the children enjoy the skate park and playground. The Bluff bar is ideal, enjoy tapas or a mezze platter with a cold beverage will enjoying live music every Friday, Saturday and Sunday night. You’ll find some great restaurants in Alex, the old Surf Club tucker is not what it used to be, in fact it’s much better. There’s also some excellent South East Asian and bistro style restaurants filling out the smart casual theme of Alex. For more elegantly turned out restaurants, neighbouring Mooloolaba has a very good range of top notch restaurants. For steak, seafood, Indian or fusion, there are restaurants that will satisfy even the fussiest palates. 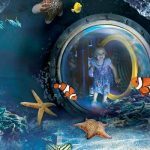 Families will enjoy the Mooloolaba Surf Club, they’ve just renovated and refurbished, and their dedicated kids area is chocka with Playstation games and a chill out zone. Beside the pool there is plenty of space to entertain, lie back on the sun loungers, or relax in the jacuzzi, and grill your prawns on the BBQ. The outdoor dining pavillion is the perfect place to have a cool drink while watching the kids splash around in the pool. The Beach on Sixth, is the ideal location for you to plan your next holiday on the Sunshine Coast. You’re close enough to walk to the Mooloolaba, Cotton Tree and Alex. It’s a short trip in the car up the coast to visit Noosa, or if you fancy, a hinterland excursion to the quaint little towns like Maleny and Montville can be a welcome break from all things beach. 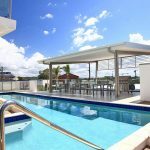 This Maroochydore luxury accommodation really should be at the top of your Sunshine Coast holiday accommodation list. Ring us today to make your booking. Are you looking for your Sunshine Coast idyll, our Cotton Tree family accommodation should be a great match. The Beach on Sixth has all the ingredients for the perfect Sunshine Coast holiday: location, amenities and modern apartment accommodation. It’s the perfect holiday cocktail. You’ll find our fully self contained apartment accommodation spacious and light with the crisp, modern interiors and furnishings a real delight. The kitchens are a pleasure to work in, with stone and glass surfaces that are easy to clean and Miele cooking appliances round out the most important space in the apartment. Of course there is a fully equipped laundry, an essential fixture for longer stays. Beach on Sixth is also close to Maroochydore Beach and the Maroochydore Surf Club. With the local beach less than a minute away, life on the beach is easy, but here on the Sunshine Coast you have the choice of many nearby beaches, each with their own charms and features than make some suitable for surfing such as the beaches at the Alexandra Headland, others great for a long stroll along the shore like Mudjimba Beach, or wandering over dunes and boardwalks at Yaroomba. For the ultimate family beach you’ll have absolute peace of mind with an outing to Mooloolaba. 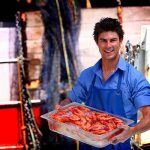 You can also grab some of the world famous Mooloolaba prawns while you’re there. There are also plenty wide open green spaces, the parklands are great to take smaller kids for a walk, there’s usually a playground handy. Cotton Tree Park and Nelson Park are nearby and always popular with young families. Staying in Cotton Tree, you’ll also have plenty of restaurant and cafe options nearby. As for shopping centres, Sunshine Plaza is withing walking distance and the local Event Cinema can be found there too. The Spice Bar in Mooloolaba is a very popular destination for families and couples alike, but closer to home The Boat Shed Restaurant has a huge following and is well within walking distance. Make sure you book your Cotton Tree family accommodation with the Beach on Sixth. There’s fun times ahead. With so many options for accommodation in Cotton Tree, how do you decide which holiday apartment resort will be the right one for your family? If you’re looking for accommodation that is clean, crisp and modern, with lots of space and light, and close to all the local attractions in Maroochydore, then the Beach on Sixth will be a very good match for you. With the superb location and resort amenities, we think you will be very happy here. There are plenty of recreational opportunities nearby and beyond. The Sunshine Coast offers a huge smorgasbord of adventure however you like to organise your holidays. 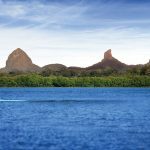 Planning is good, but here in Cotton Tree you can go with the flow whether you want to go shopping, feel like an early morning surf, or just getting in the car for a tour around the hinterlands. 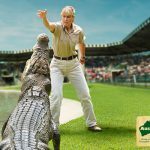 You can experience the best of the Sunshine Coast in a relaxed and easy fashion whether it’s a trip to Australia Zoo, the Big Pineapple or Sea World. Closer to home, you’ll feel right at home with the hospitality of the local surf clubs, whether it’s a walk down the road to the Maroochydore Club, at Alexandra Heads with it’s floodlit skate park right next door. Down in Mooloolaba the club is the perfect for date night. Fuel up with mains and leave the children downstairs in the kids chill zone. They will stay entertained for hours with wall-to-wall play stations and beanbags. Back at the Beach on Sixth you can wind down and grill your prawns in the BBQ pavillion beside the pool, otherwise if it’s a night in then the chef will get a chance to see how good the Miele cooking appliances really are. Chill with Foxtel and surf with the wi-fi. With your accommodation in Cotton Tree, you and the family are all set. Book now and make it happen. Take a look at these Cotton Tree accommodation specials. You’ll get the best deal booking direct at the Beach on Sixth. Our luxury studio, two and three bedroom apartments are the perfect place to stay for your Cotton Tree holiday. Beach, sun, surf, the hinterland and all the conveniences of an urban locale: top notch restaurants, cafes and a great retail destination nearby. 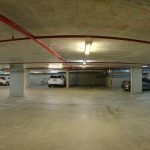 The Sunshine Plaza in Maroochydore is a five minute drive away and there’s always plenty of parking. We run accommodation specials at certain times of the year for direct bookings. Subscribe to our newsletter and facebook page to stay updated with our latest deals. Always book direct with Beach on Sixth for the best rates on your Maroochydore accommodation. You will want to book this Maroochydore resort quick smart. Beach on Sixth is exceptional. This resort offers everything you could need for your next family holiday on the Sunshine Coast. It has a superb location close to the beach and is an easy walk to a great range of dining and shopping options. The shared outdoor entertainment area in the courtyard is a lovely place to relax during the day and in the evening after a hard day at the beach. Chill out in the outdoor spa and throw your Mooloolaba prawns on the barbeque. Dine al-fresco under the shelter of the covered outdoor dining area. The Beach on Sixth, including the studio are all fully self contained, the two or three bedroom options all come with a fully equipped chef’s kitchen, with easy care surfaces — composite stone surfaces and glass splash backs with stainless Miele cooking appliances. These beachfront apartments at Maroochydore are just minutes from everything that you could possibly need on a beach holiday. Just stroll to a range of restaurants, cafes and boutique food retailers. You’ll find a range of organics and crafted foods ready for your table. 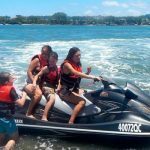 Of course you don’t have to stay in Maroochydore all the time, there is much to explore on the Sunshine Coast, the nearby beach areas, a day at Australia Zoo or Aussie World. Perhaps take a drive into the Sunshine Coast hinterland. Each day is different. You will never be short of fun and exciting activities to do, or if you feel like relaxing, then you can do that to. Here, at the Beach on Sixth. Lounge by the swimming pool, or on the beach. Top up your tan. Book this Maroochydore resort quick smart. Beach on Sixth has it all. Your holiday accommodation on the Sunshine Coast is here. Here’s Cotton Tree luxury accommodation that will tick all the boxes. It’s the smart choice for your holiday on the Sunshine Coast. Close to Alex (that’s local speak for Alexandra Heads) and even closer to Maroochydore Beach the Beach on Sixth holiday apartment resort offers you and your family the perfect location for your stay on the Sunshine Coast. Our sunfilled studio, two and three bedroom apartments have crisp modern interiors that provide you with a no fuss approach to accommodation. The apartment layouts have living, dining and kitchen occupying an open plan configuration, with balconies extending the living space outdoors for breakfast, lunch or dinner al fresco. It’s also a great space to chill with a good book. The kitchens and laundries are all fully equipped. Chefs will enjoy the well laid-out kitchens with easy to clean stone and glass surfaces, with the Miele cooking appliances. Along with the luxury of this Cotton Tree accommodation, is the luxury of choice; the things to do and places to see on the Sunshine Coast are almost endless. Even within the specific geography of the Maroochy shire there is a wonderful diversity of environments to explore, from the the mangrove wetlands of the Maroochy River, to the wide open inland river spaces. Hire the standup paddleboards for the family, kayaks or even a BBQ pontoon and cruise the river at your leisure. Eat, fish and enjoy the company of friends and family. These pontoons have everything required for a fun-filled day out on the river. Life jackets, petrol, fishing tackle and bait and of course the piece de resistance: the BBQ. If you haven’t been partaking of that activity during the day then dinner at the BBQ pavillion beside the pool is the perfect end to a perfect day. Start ticking all the holiday boxes with this Cotton Tree luxury accommodation. The Beach on Sixth. Book now. Beach on Sixth is Maroochydore accommodation that should be at the top of your list when looking for the right Sunshine Coast holiday accommodation for your next getaway. This crisp, clean, and modern holiday resort is the perfect place to bring your family for the time of their life. With fully self contained holiday apartments ranging from studio suites through to two and three bedroom abodes, all your options are covered whether you are on a romantic adventure or bringing family and friends together for some quality relaxation time. 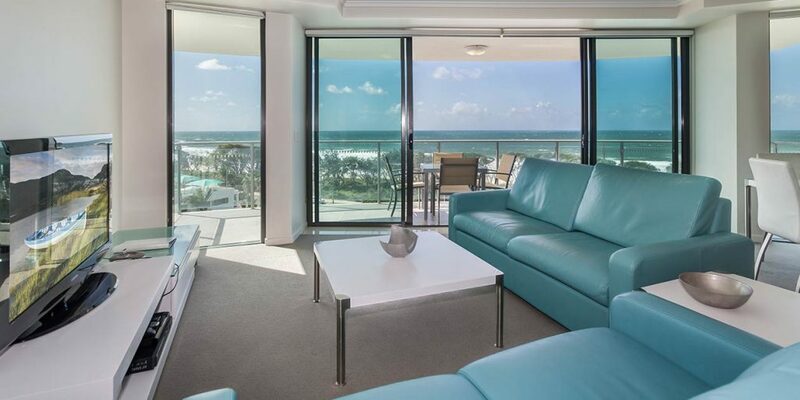 There’s plenty of room and lots of different vantage points to choose from at these Maroochydore holiday apartments. Enjoy views across the Sunshine Coast with the sub penthouse vistas providing sweeping panoramas from Yaroomba to Point Cartwright. The open plan living, dining and kitchen areas are generously apportioned spaces with quality fittings and furniture throughout. The kitchens have stainless Miele appliances and have been finished in elegant stone and glass easy care surfaces making it a delightful place to prepare meals. Air con, Foxtel and wi-fi are also there for your convenience. The balconies provides some handy outdoor living with outdoor dining furniture for al fresco meals. The balcony also has outdoor light fittings so you can extend your outdoor entertainment and dining until as late you like. Once you know you have the perfect place to stay, you can quick get on with the business of exploring the Sunshine Coast and the surrounding areas. Maroochydore offers you a very convenient and versatile playground for you and your kids. With the fully surf patrolled beach just across the road and plenty of other beaches to surf and swim in the immediate area, you know that this could be your best holiday beside the sea yet. Come back and unwind in the pool, soak in the spa and get your evening barbeque on the grill. The Beach on Sixth really is the Maroochydore accommodation you should be booking. Book now. The season is on.